That is a cute dress - I always like polka dots :) It layers up beautifully here for the cold weather too. That dress is adorable! 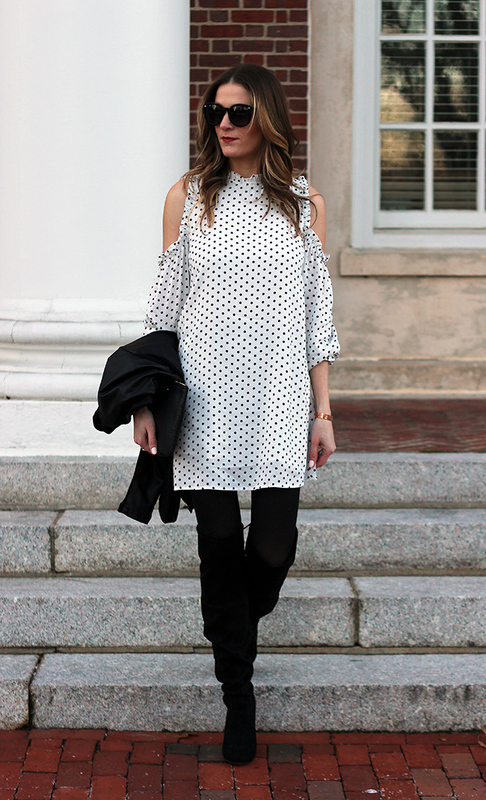 Love the dots, ruffles and cold shoulder details! Beautiful styling for a cold weather day! That dress IS too cute, I just love the cold shoulder AND ruffle combo! And, it being b/w you'll be able to accessorize it so many ways. I am LOVING the off-shoulder on your top. Great tips on how to wear these now with these fickle temps. It was freezing last week--today it's gonna be 78! Hope you're up to something FUN this weekend!! I was running around Traverse City in just a sweater! That's unheard of Up North in February! I adore the polka dot top!!! So cute! You styled it perfectly! I feel like I still need to get some mileage out of my OTK boots before the spring hits! Thanks for supporting my link-up! It means so much to me, girl. Have a great weekend! Such an adorable dress! I love the polka dots and the ruffles around the cold shoulder cut outs! 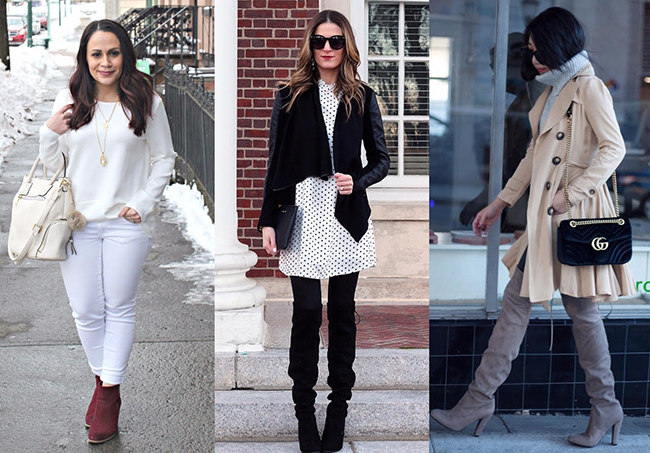 I am totally with you on layering up the Spring pieces while it is still bitter cold! Well done, my friend! Looooove this dress, lady- how fun for spring? And you've warmed it up for late winter with these pieces! The weather makes it so hard for all of us to get a head start on spring! And I am so ready!! Love this dress, and of course that chic blazer. The cut of it is so perfect! Love the cold shoulder detail on that dress! You styled it perfectly for now. I am itching for spring pieces now too. I adore this polka dot dress with the cutouts! I've been rocking my spring dresses with week with this amazing weather and getting me so excited for real spring! That's a super cute dress! It looks great layered and will be fabulous when it's warmer. What a fabulous look! 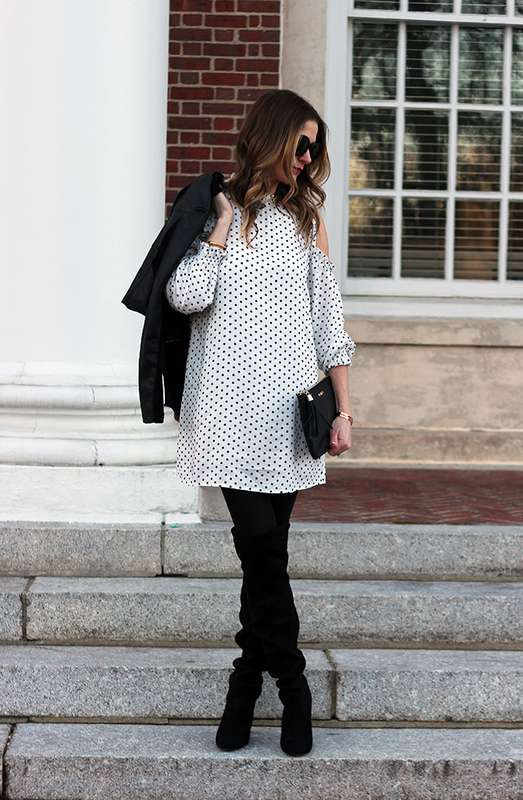 Love how you styled this dress perfectly for the winter into spring weather! So fabulous! I love that polka dot dress. It's layered perfectly with tights, boots and jacket. I love wearing Seasonal outfits in different Seasons! I completely empathize with you. I am so done with winter but around here it holds on well into March and sometimes longer. Love the way you are introducing spring pieces by layering, great look. What an adorable dress! Love the cold shoulder! Perfect transitional outfit. Bring on Spring!!! Love the cold shoulder. I love the cold shoulder style!